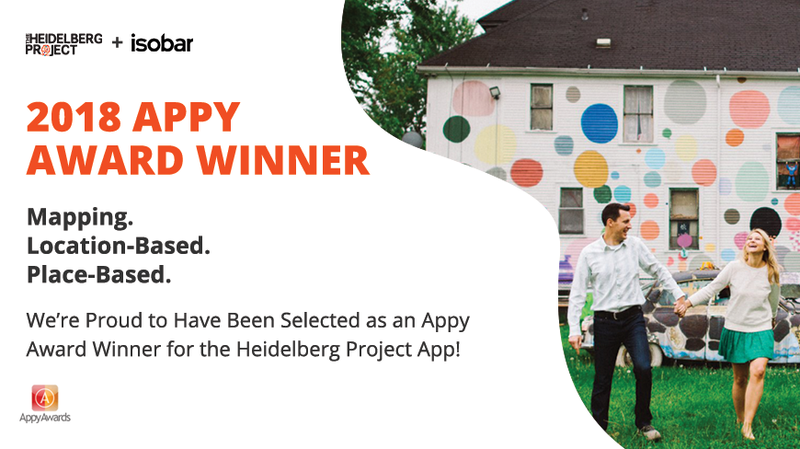 DETROIT – MAY 18, 2018 – The Heidelberg Project App has been awarded a MediaPost Appy Award in the Mapping/Location-Based category. The app, created by global digital agency, Isobar, was also a finalist in the Charity/Non-Profit category. HP is an outdoor art installation founded in 1986 by Tyree Guyton as a creative response to urban blight and decay in the Detroit neighborhood in which Guyton grew up. Over 32 years, HP has served as a community organization that improves the lives of people and neighborhoods through art. The app, designed to guide users through a unique tour of the site leveraging GPS technology, is the first step in a digital transformation that is part of the Heidelberg Project’s new vision, Heidelberg 3.0. By bringing innovation to the outdoor art exhibit, The Heidelberg Project is allowing the art to live beyond its physical space for generations to come. The digital transformation of the Heidelberg Project gives it a chance to influence not only Detroit, but the future of art, technology and education. The MediaPost Appy Awards honor excellence in mobile apps. Details about the Appy Awards and a list of winners in all categories can be found here. Newer PostHappy birthday to our neighbor Ms. Irma Hollingsworth who turns 106 today!